"Fair Enough" was the tenth episode of the second season of Daria. The roof of the school library collapses, due to Ms. Li pilfering from the maintenance budget to buy her new lie detector. In order to raise funds to get the roof repaired, she organizes a "mandatory voluntary" medieval fair, which will feature rides, period entertainment, and a play, The Canterbury Tales. The play attracts hopefuls like Kevin, Brittany, Quinn, and Sandi to the auditions, where Quinn gets the lead part opposite Kevin. This makes Sandi extremely jealous, and motivates an angry Brittany to do everything she can to keep Kevin away on the day of the fair. At the fair, Helen and Linda Griffin get into another one-upmanship contest; Mack suffers as a 'dragon' that kids get to beat about the head, while Upchuck causes suffering as a minstrel; Ms. Barch reads anti-marriage fortunes and Mr. DeMartino lives the dream in jousting, getting to batter students and get away with it; and Daria and Jane try their best to avoid getting involved in any of the activities. The weirdness finally catches up with them, however, in the form of Stacy, who's upset over being dumped by a boy she had dated and ends up sharing a ferris wheel ride with Daria and Jane, screaming her lungs out at them. They manage to convince her to not flush her entire life down the toilet just because one jerk didn't ask her out again. Backstage at the play, Quinn is going over her lines when Sandi, who's still smarting over being passed over for the part, plants a tiny seed of doubt in Quinn's mind with regards to how a certain line should be spoken. Mr. O'Neill, meanwhile, is frantic over the fact that Kevin is still missing, and in desperation, he drafts Jeffy as a last-minute replacement. Angry that he's co-starring with Quinn and note them, Joey and Jamie point Jeffy to the wrong play, with the result being that Jeffy reads the wrong lines while Quinn places the wrong emphasis on her words. The audience erupts with laughter, which upsets Quinn, which angers Jake enough to get angry and start shouting at the audience members, which in turn starts a riot... with Linda and Sandi exchanging self-satisfied smirks at the carnage they've caused. As a devastated Mr. O'Neill goes to Ms. Barch for comfort and Jodie tries to find Ms. Li in order to quell the riot, Daria and Jane amuse themselves by telling a group of kids what life was really like during the Middle Ages. Daria Morgendorffer, Kevin Thompson, and Brittany Taylor are nearly killed by the collapse of the Lawndale High library roof in the opening scenes of this episode, but escape with minor injuries at the worst. Few fanfics have used this event in an alternate-universe manner, supposing their injuries were more severe. Late 19th c./early 20th c.
Cornelius Vanderbilt - railroads - "The public be damned"
Stacy's position in the Fashion Club is made clear: as she cries over being stood up by Bret Strand and right after saying she's glad she can count on her friends, Tiffany asks if that mean she can date him. 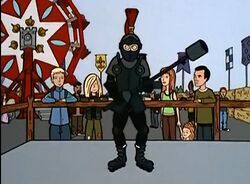 The episode pokes fun at medieval/renaissance fairs and reenactors, using small details that indicate that the writer of the episode was familiar with the culture, such as the girl with the poorly-fitted sideless surcoat shown as one of the play actors or the "q-tip" padded weapons shown. DeMartino refers to Joey using dyslexia as an excuse for bad grades. A caricture of director Guy Moore shows up at the start of the fair, dressed as a pope and drowning his sorrows. "Always Beside You," by TAG: Daria is killed in the collapse of the Lawndale High library roof, leading to great changes in the life of her best friend, Jane Lane. This page was last edited on 31 March 2014, at 23:00.